It's been both a very busy and a very unproductive week. My parents came up last weekend, just in time to help out with The Daughter's third birthday party and then stayed with us all week (they left yesterday morning). So we've been entertaining them (badly - I've been knackered all week!). This weekend just gone The Wife was away too, so after mum and dad left on Sunday morning I was sole parent in charge of The Daughter until The Wife returned at eight this morning. Lots of fun, but surprisingly hard work - I'm knackered again! This week I'm hoping to make it to Newcastle Playtest tomorrow night, so fingers crossed I'll at least get a chance to get some playtesting in and go through the feedback I got from the other Playtest UK groups re. Zombology. Hopefully, things will pick up next week! After considering the prolific Daniel Solis' Kigi for a while, I happened to catch a note of his on Google+ a couple of weeks ago stating that it was the final day of the sale he runs every summer. So I decided to jump in an order a copy of Kigi from Drive Thru Cards. Kigi is a beautiful game (that much is clear from all the pictures I've seen of it) and it struck me as a good opportunity to check out how Print on Demand (POD) works from a customer's perspective while considering it as a publisher (since it's another option I've been considering for publishing Zombology). I ordered the game one Saturday night from the Drive Thru Cards website. Pretty standard stuff, it was easy to use and all went very smoothly. I bought Kigi ($9 sale price) and a plastic deck box ($1) which all seemed very reasonable. Shipping to the UK was $14.70 which was a bit galling, that's more than the game! Still with the exchange rate the whole thing came to about £16, which doesn't seem to bad for a small print run game. I got an email on Tuesday telling me they had shipped the game, which is not bad considering they had to print it and cut it out first. Shipping took eight days - arriving on the following Wednesday in a little box which protected it nicely during transit. The biggest advantage of POD from publisher's point of view is the lack of associated hassle and cost. If I make a hand-made game and sell it through my website there's a lot of time and effort required, plus a lot of upfront cost if I don't KickStart it. With POD all I'd have to do is upload the files and choose a retail price, no cost or effort involved. 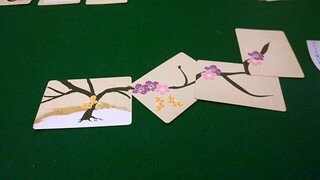 The cards were very well made, better than I could manage by hand. Shipping to the US/Canada will be quicker and cheaper than from me in the UK. Cross-selling opportunities - people going there to by one of Daniel's or another designer's games might see an ad for Zombology and add it to their order. Shipping to the UK (where a lot of my friends & family customers are) is exorbitant. I prefer card games in tray and lid boxes with large format rules - I broke the plastic deck box the day I got it and having the rules on half a dozen cards is a bit fiddly, it's easy to get them muddled up. If the shipping to the UK wasn't so high, I'd be very tempted by Drive Thru Cards. There are other options (e.g. The Gamecrafter) that might have more affordable shipping and different packaging options. I need to investigate those too. In other news, I'm making decent progress on my German app, it's coming along very nicely. What I really need to do now is get a load of vocabulary into it. I need to start reading the data from a file, rather than hard-coding it in. As I'm sure most of you are aware, the title is a reference to Race for the Galaxy, one of my favourite games and one which I've played exactly 150 times according to BoardGameGeek. There's a sliding scale of producery-consumerness (a technical term, check out the Big Five personality traits) on which, I'm assuming, most people sit slightly nearer the Consumer end than the Producer end. Some people are happiest reading a great book, or watching a great film or shopping for new clothes. Some people however are happiest when making things, whether knitting cardigans for babies (thanks Mum! ), writing novels or painting. It turns out I'm definitely towards the producer end of that scale. By day I'm a computer programmer, and I love that I can type words and bend a computer to my will, creating programs and apps that are useful, interesting, attractive or just fun. By night, I'm just as bad. Historically it's been writing (bits of!) computer games, painting miniatures, designing worlds and stories as a DM and obviously designing board games. It struck me this week that probably the bit I enjoy most about game designing is actually the graphic design. Working with a very limited set of artistic skills to make prototypes or hand-made games that are attractive, or at least functionally well designed. Don't get me wrong, I also enjoy trying to wrestle in my head with the game design to design something that's fun to play and there's something zen-like about cranking out well-made hand-made games, each one lovingly hand-crafted but done well. And the end result is satisfying too, when you hear from a gamer who has played one of your games and really enjoys it. I'm not a great game designer, so it's rare enough that I hear from a gamer who loves one of my games, but when it does it brings a smile to my face every time - I've brought pleasure to another human being, often someone I've never met (and probably never will). That's pretty cool. Why this philosophical train of thought? I've been agonising over whether or not to do a hand-made run of Zombology for a couple of months now, after bravely/foolishly committing to doing it at the beginning of the year. The concerns that have given me most trouble are not having enough time to get to the conventions I need to attend to drum up sales and whether there's still a market for hand-made games now that everyone can make a professional run of a game they've thought of through KickStarter. I've asked the question in a couple of places and the advice seems to be that I should embrace KickStarter and do what I plan through there. Assuming I was successful on KickStarter, most or all of the games would be pre-sold so convention attendance would be less critical, so that could be a plus point to going that way. Anyway, Im not leaning toward KickStarter, despite my earlier antipathy towards it. I'm flighty like that. In other news, I've got some feedback from a couple of playtest groups. Both of them only played it three player (the weakest I think). The other Playtest UK group played it a couple of times, and didn't seem overly enamoured. In the second game they tried changing a couple of rules. They did however provide really good feedback which I need to go through and learn from. The other group had played it before (about a year ago) and really liked this new version, playing it eight times (though still only three player). They suggested a rules clarification that I'll have to make shortly. This week is mostly about trains. I hope to make some good progress on the Zombology art upgrades on my way to and from my quarterly hospital visit to Sheffield on Wednesday. I've been working on a couple of things this week, making good progress on one, and working out in my head what to do with the other. The first is my learning German app that I'm writing for my phone. This week I've made loads of progress on in. The first half of the week was refactoring the crap out of it, removing a load of duplication, specialist classes and generics and just making the whole thing far, far simpler behind the scenes. That set me up well for the second half of the week where I added staged repetition and improved the styling quite a lot. There's still very little vocabulary in there, but I figure once I've got it working how I want I can start adding vocabulary wholesale. For the moment just getting it to the point where it's a useful tool for myself will be great. I'm really pleased with the progress I've made this week, it feels like it's developing rapidly despite working on it in my free time around work and a family. The second thing alluded to in the title is the Zombology graphic design. I've got a moderately attractive (if very simple and hobby-esque) prototype that has been slowly improving over the last year or so. I'm fairly happy with a lot of it now, it's simple, but it's ok for a hand-made print run. The weakest links now are the zombie overrun card, the pay rise card and the round marker cards (which also feature zombies). If I'm honest the weakness is my piss-poor attempt at drawing a zombie. It's bad. It's also not really in keeping with the rest of the graphic design, so it's letting the side down and standing out as well. I've had an idea this week about how I can come up with something that's more in keeping and within my limited art skills. So the next thing to do is break out my abysmal old, slow laptop and crack on in InDesign/Illustrator. I've got four hours of train journeys in a couple of weeks for my clinical trial hospital visit, but I hope to make a start on this stuff before then. Hopefully, I'll also have some feedback from the other Playtest UK groups soon too, which will give me a more unbiased view of the quality of the game. In other news, I've crossed Hansa Teutonica off my ten plays list with a game at Games Night last Wednesday and I'm leaning more towards a hand-made, stretch goal/pledge level free run on KickStarter (despite my KickStarter misgivings). Need to do some more market research still, but the idea is taking root in my head. Is there still a market for lovingly hand-crafted short print run games in the age of KickStarter? That's the question I asked on BGG this week in an effort to help me choose whether or not to dive in to self-publishing again as I did back in the early days of Reiver Games. Are there 150 people out there who would be willing to buy the game? I need to answer question one myself, and that's what a lot of the soul-searching has been about this last month or so, but if the answer to question two is no then question one is a moot point. I can't answer question two myself, I can only have a guess at it. So asking the question on BGG is a way to get a better understanding of the changes in the market that have occurred since I stopped hobby publishing back in 2008. I've had quite a few answers, lots of them pointing towards using KickStarter, even with the hand-made limited edition run that I'm planning. Assuming these respondents are right and the lack of stretch goals, pledge levels and professional manufacturing doesn't sink it on KickStarter, I might have to get over my dislike of KickStarter and look into that. There's definitely a lot to be said for the free marketing that comes from running a KickStarter campaign. In other news I've been cracking on with writing my German language app on my phone again this week, moving towards getting the spaced repetition functionality in there. I also made it along to Newcastle Gamers on Saturday and knocked a play of Hansa Teutonica off my 'play every game I own ten times' goal. I also got to try Zombie Dice and The Palaces of Carrara for the first time too. This week it's Newcastle Playtest on Tuesday, but sadly I'm going to have to miss it again.